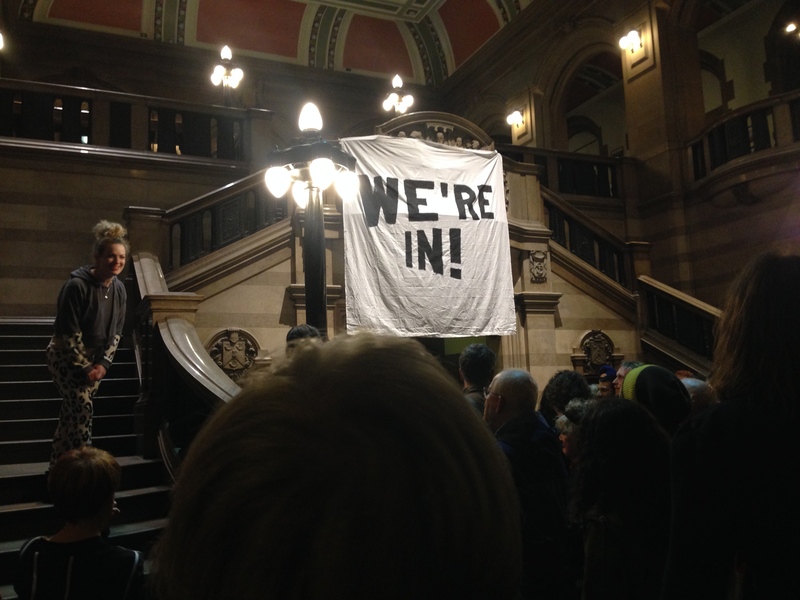 These are the first lines of a new performance from award-winning theatre company, Common Wealth, which premiered last week in the Council Chambers at Bradford City Hall, The Deal Versus The People. The speech is an impassioned appeal from a young man in Bradford – ‘just a normal guy’ – for collective political action in response to the growing gap between the rich and poor and extraordinary pressures on communities created by austerity. Without giving too much away (the piece may tour next year), the opening is startling, especially when played out against the backdrop of the opulent council chambers. Semi-circle rows of ornate chairs and desks with microphones and translation screens face two tiers of even more ornate chairs positioned above the rest, with the impressive and all-surveying mayoral chair the focal point. The young man stands on a large polished table in the centre of the room, interrupting the mayorial sight-line – angry, directly addressing the audience, speaking in an urgent and emotional register – promising to commit an outrageous act to get attention and ‘be the person who started to change things’. The audience is immediately off balance. ‘You thought, they wouldn’t really do that in a play would they?’ said an audience member afterwards. 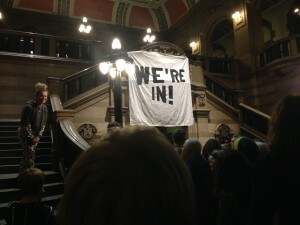 As we waited for the show to begin in the foyer, a banner was unfurled over the stairwell by two activists in balaclavas that read – ‘we’re in’. The place for elected representatives and calm, considered debate was temporarily occupied by ‘the people’ – the voters, as well as by those without the heart to vote for politicians who do not appear to represent them or understand their lives. 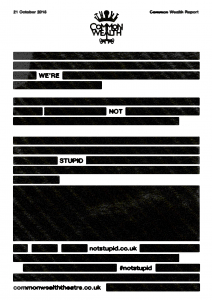 The Deal Versus The People is a play about a trade deal – the Transatlantic Trade and Investment Partnership (TTIP). The play came about in response to a direct invitation from Ruth Bergan (Trade Justice Movement) to Common Wealth to create a piece of theatre responding to TTIP. TTIP is a controversial trade deal currently being negotiated between the EU and US – it promises to establish the largest free trade area globally, and there are serious concerns about how the deal may create a ‘race to the bottom’ as regards food and production standards, with concomitant negative effects on the well-being of communities and workers rights on both sides of the Atlantic (see references below for information on TTIP). With funding from Arts Council England and Bradford City Council, and additional support from UNISON and West Yorkshire Playhouse, auditions for the show took place in community centres across Bradford in summer 2015. The audition flyer stated ‘No acting experience necessary, we are looking for people who are not normally represented in politics, have never performed professionally before and are of all backgrounds and ages … we are particularly interested in people who have experiences of unemployment, all languages welcome’ and a core cast of four performers and a larger community cast were appointed. Following a trip to London to speak with TTIP experts from the UK government, War on Want and Friends of the Earth, there was a four week devising and rehearsal process, with the script developed by the cast, working closely with playwright Aisha Zia from Common Wealth and Daniel Bye. The cast drew on their own experiences of living in Bradford to create a response to TTIP – Bradford is a city negatively affected by the neoliberal economic policies that TTIP threatens to further enhance and enshrine, with high levels of unemployment and poverty. As Ruth Bergan from the Trade Justice Movement commented in her blog about the pilot project (which too place at Toynbee Hall last year), ‘this kind of economic disruption is most likely to hit the least-well-off communities hardest, yet they have had no say in the development of the deal let alone the content of the negotiations’. Common Wealth make theatre that responds to imaginative combinations of sites, people and experiences. Here, the site is a debating chamber in a city with a history intimately related to the ebbs and flows of free trade (for a short account of this history see ‘Bradford shaking’ – a piece of writing I did for the digital accompaniment to the show. 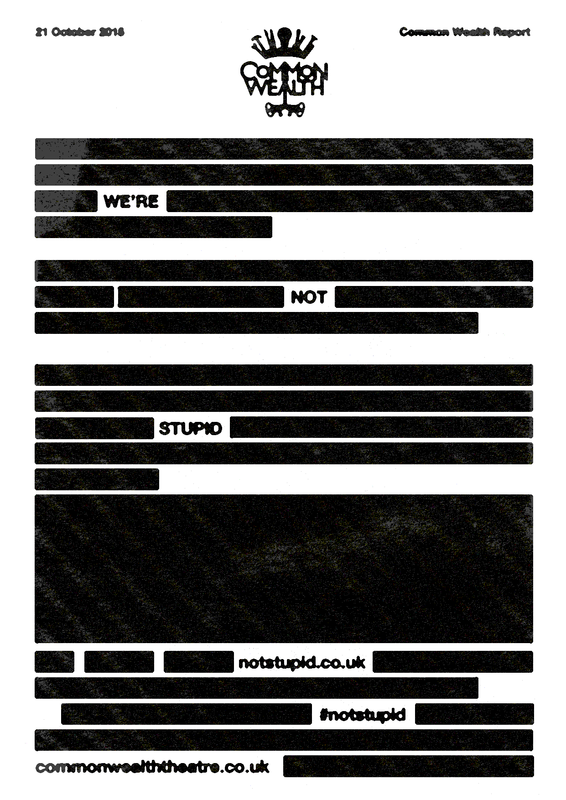 Thid website – notstupid.co.uk – was developed by digital designer Matt Wright, from Slurp Design). In previous shows, Common Wealth combinations have included empty houses on social housing estates (for Our Glass House – exploring domestic violence) and young Muslim women in boxing gyms (No Guts, No Heart, No Glory). The company like working with people who have not performed in a professional theatre context before, and their performances provide a platform for voices and experiences all too rarely represented on stage with any richness or complexity. I was pleased to be invited to reflect on the process with the company – and am in the middle of conversations with cast, partners and artists, to be written up over the next few months. The rest of this blog post is about the performance itself. Watching the performance, I became slightly obsessed with tracking these breaths, echoes, rhythms and refrains. There were many – the anarchic destruction promised by the opening speech emerges again in a quieter scene a few breaths later, where we meet a woman creating a recipe from the contents of a food bank parcel – ‘a meal of last resorts’. And then again later, fizzing with a more celebratory energy as a noisy occupation is staged. The character motifs of mothers and sons reappeared throughout, focusing our attention on a relation of care – the pressures placed on this relationship in times of austerity provided an important emotional fulcrum for the play. The standing man on the table at the start becomes a figure of frustration and creativity that dances around, over and on top of the table midway through the performance. The plea to pay attention, to listen, to respond, carries its echo throughout as the cast experimented to find the right mode of political expression. A theme of silence and noise resonated through the text and performance – ‘there are a lot of silent messages in our communities, telling us that we don’t matter’ – and extended into an aural landscape created by a music and sound score from composer Wojtek Rusin. The rhythms were also reflected in a scene that traced the rise and fall of the city itself, supported by an ingenuous design by Michelle Wren. 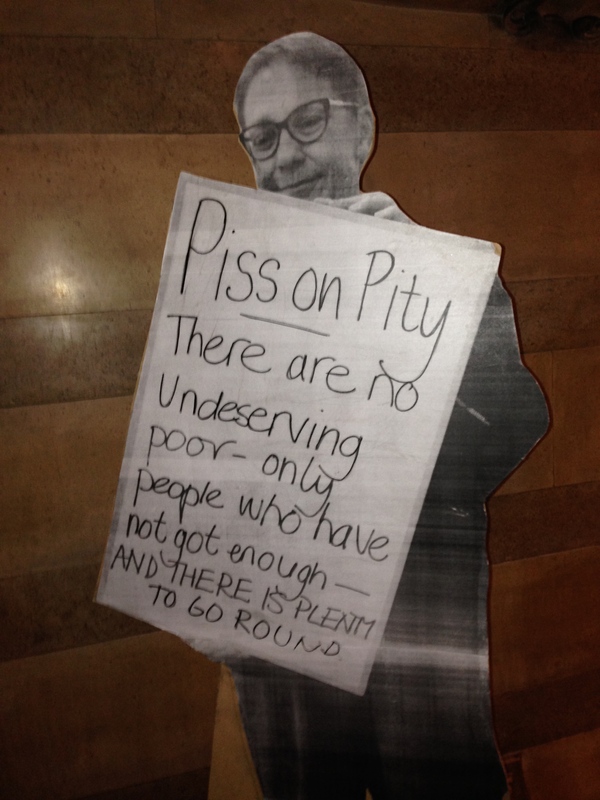 Here, a pop-up cardboard Bradford appeared and demonstrated Bradford’s wealthy history, transformed by closures of workplaces, buildings, facilities – ‘the free market closes more than it opens. That’s what we’ve seen in Bradford’. This pop-up Bradford was a parody of a model you might see at a town planning meeting – with the full throttle embrace of free market capitalism, social planning becomes a quaint and out-of-date notion. The play responds to the closing down of debate that can seem a feature of the formal political public sphere – something that is also sensed in the space of the council chambers. As director Evie Manning said early in the process – ‘you walk in there and start talking in whispers – you feel hushed – we are going to make a piece that creates a lot of noise’. An odd feeling in a space carefully designed to facilitate debate, perhaps, but this is also an incredibly hierarchical space that reveals the contradictions of representative democracy. The mayoral seat is on high, and the laypeople’s chairs hidden away at the back or in galleries above – excluded from the visual and vocal scenario created by the architecture. The Deal Versus The People is far from a theatre of debate – it is rather an explosive performance of feelings and frustrations generated by the corrosiveness of austerity. That is, of experiences that cannot be so easily put into words, and that the dry, all-too-easy rationalising register of deal-making dismisses, sublimates and excludes. The oral registers of deal-making seems designed, in the words of an audience member ‘to keep you out of it – they want you to be too tired to engage’. The Deal Versus The People insists on a new communicative fulcrum, one founded on an appreciation and care for the social, the intimate – ‘I’m a. Living. Thing. Not a. Deal to be made’ – reminding the deal-makers of the incalculable energy of bodies in movement, and the immeasurable effects of deals made in ignorance of these presences.